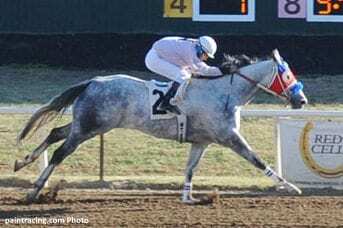 Jockey Mario Chavez was aboard Fishin Paint in Saturday's third race at Will Rogers Downs, breaking from the inside post position in a 350-yard Futurity for 2-year-old Paints and Appaloosas. The horse broke a bit awkwardly, but Chavez was able to straighten him out and put him back into the race. Less than 100 yards in, Fishin Paint took a sudden, sharp left turn and crashed into the inside rail, dislodging Chavez. The 42-year-old jockey was airlifted to Tulsa's St. John Medical Center, and Will Rogers officials made the decision to cancel the rest of Saturday's 12-race card. Equibase's chart reports that Fishin Paint did not finish the race, but walked off the track under his own power. According to long-time employer Ray Enlow, the owner and trainer of Fishin Paint, Chavez suffered severe brain trauma resulting in irreversible brain damage as well as a broken neck. Chavez was kept on life support through Saturday night and Sunday morning, but the machine was the only thing sustaining his life functions. Family members made the difficult decision to take Chavez off life support at 2:00 p.m. on Sunday, and the rider passed away peacefully surrounded by his loved ones. Chavez has worked with Enlow for 26 years, helping grow the racing business from a fairly small operation to over 40 Paints and Quarter Horses in training. Enlow also developed a farm in Oklahoma where he and Chavez bred, broke and trained most of their own stock. Chavez leaves behind a wife of 23 years, a son and two daughters. His son is also involved in the racing industry. This entry was posted in NL Article, People and tagged Horse Racing, jockey death, jockey dies, jockey fall, jockey injury, mario chavez, Oklahoma, paint horse racing, ray enlow, Will Rogers, will rogers downs by Paulick Report Staff. Bookmark the permalink.